Is another fruitful year for me and my love . 7 year of knowing each other. Today , 7 years ago , we first met at UQ sport centre. Who will know that meeting is not a one off but is for a life time. Wow too romantic for a true !!! Ya sort of , at time we still can not believe such thing will happen in us. Being both very practical person in life , we do not believe love at first sight, indeed our love story does not happen at the first sight. Each year when we celebrate the day we met each other , our heart is just full of thanks giving. Is GOD has brought us and bind us in HIS love. From last year onwards I promise will start to bake for ourselves in our special day and special moment. We were quite sick the past few days. Just could not shake off the stupid flu cause by the unpredictable weather in this winter. Praise GOD finally with a few night of great rest and lots of water, we have much improve plan to go out for a good celebration within this week. I have come across this cake few months ago , it was the blogger 9th year anniversary celebration that she bake this cake for her special occasion. Love the idea and the surprise in the cake . Therefore , I decide this will be the cake for my 7th year of knowing each other celebration. 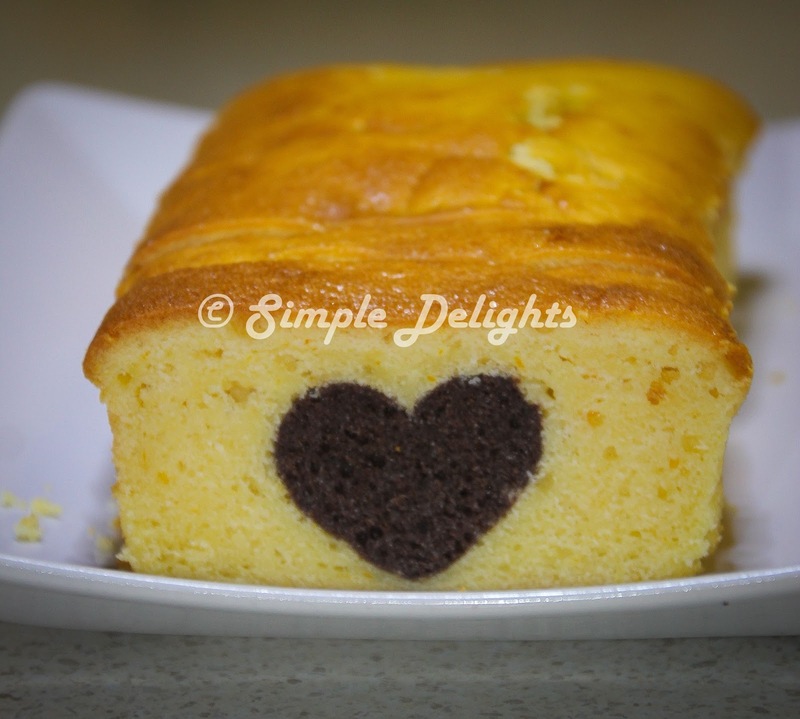 The original cake recipe is for pound cake ->小小米桶的写实厨房。 However I have adapt another recipe for the outer cake ->The Little Teochew. Hence below is the cake from my own adaptation. 2. Mix the cake flour, cocoa powder , baking powder together. Sieve it twice to ensure it combine well. 3. Used a hand held mixer beat the butter till fluffy.Pour in the condense milk slowly in the mixture and beat in combine well. 4.Mix the egg in portionly and beat well to the mixture. 5.Fold the flour into the mixture . Pour the cake mixture into a rectangle (20cm x 10cm x 6cm) mold. 6.Bake for 30-35min in 170C degree or when skewer insert come out clear. 7.Unmold the cake after cool down. Used a heartshape cutter to cut the cake into heartshape. I totally forget to take picture while baking and the cutting. I guess when one is unwell, our strength can only focus at one task instead of multitask. For the outer layer cake I used another recipe which I think will give a different taste and I was thinking to do some frosting in decorate this cake for my special occasion ^^. After finished the baking I guess it does not need anything extra for the night. Perhaps next time I will try something different . 6Tbsp milk + 6 Tbsp orange juice ( if you do not want too orange taste can used 12Tbsp milk). 2. Mix the flour, baking powder and salt together. 3. Used a hand held mixer on medium speed, cream butter and sugar till fluffy . 4. Beat in orange zest follow by egg into the mixture. 5. On low speed, add flour mixture in 3 portion alternate with orange milk. 6 On mixer to medium and beat for 10 - 15 sc, just until batter mix well and is thick creamy. 8. 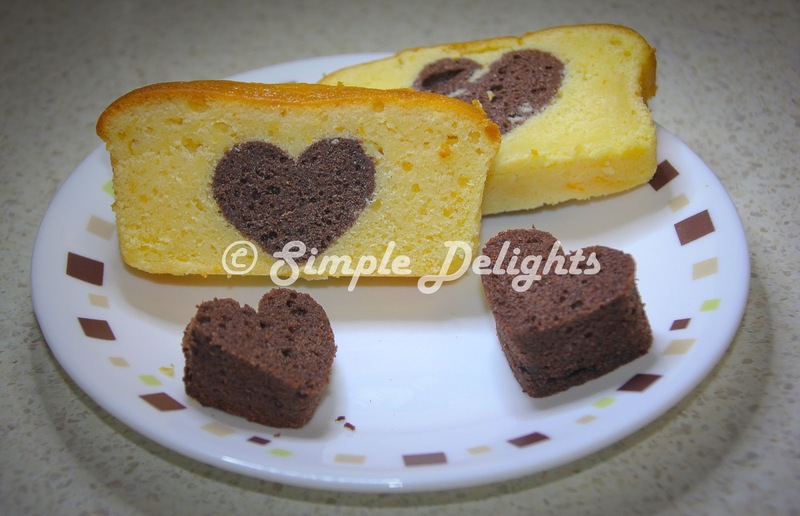 Make sure the heartshape cake fit tight one after another in the tin. Pour the rest of the batter on top of the cake to cover it well. 9. Cover till 80% of the pan so it will not overflow. 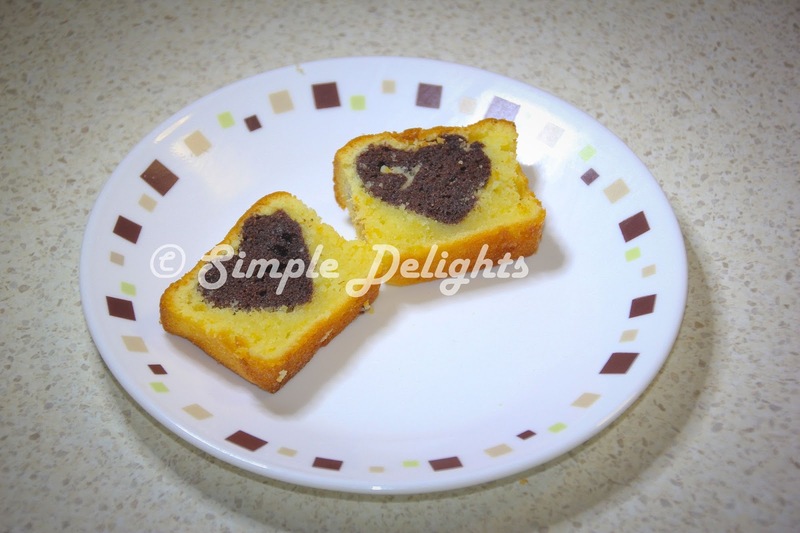 Bake the cake in low shelf of the oven with 160C degree 30min.Or till skewer come out clean. 10. Once cake is done , unmould it and let it cool before serve or ready for frosting. I did not pour all the orange butter cake to bake ,I thought it might rise too tall , turn out I should actually pour all in , I make a few small cupcake size cake since I have extra heartshape cake. Well they both taste yum and love the fragrant of orange in the cake. Well this might be something you would love to try out for your special one on the special day. Is really quite easy and the effect is SURPRISE ! May GOD continue to grow us in loving each other more as we continue our journey with HIM. It always warm my heart to think back those moment we be together before we tie the knots. Thank GOD for you my love. Thanks for liking what I post.